As I padded along the boardwalk threading Bermuda’s Paget Marsh, the buzz of scooters diminished and pastel-colored white-roofed buildings disappeared. The elevated trail slices through tangles of red mangrove and forests of Palmetto palms and giant ferns and edges a sawgrass savannah. It ends in a stand of centuries-old cedars. “The Railway Trail is a charm bracelet,” my guide, Tim Rogers said. “With charms, like Paget Marsh, dangling from it.” He considers this brackish peat marsh one of Bermuda’s treasures. It’s the most northerly mangrove swamp in the world, and it’s a haven for birds. “Seventeen species of birds breed here, and over 200 migrants come in winter,” Rogers said, as he points out a green heron posing in the murky waters. The nature reserve is a short detour off Bermuda’s Railway Trail, a noncontiguous 21-mile scenic right-of-way that’s one of the island’s unsung assets. It follows an old railway bed that stretches from St. George, a 400-year-old World Heritage Site on the East End, to Somerset, site of the world’s smallest drawbridge, on the West End. Some sections edge the coast, passing hidden beaches and abandoned forts. Others slice through woods and fields, parks and preserves, passing under canopies of oleander, hibiscus and Surinam cherry. Occasionally it allows a peek over backyard fences into the lives of everyday Bermudans. En route, interpretive signs detail historical sites and railway lore. Built between 1926 and 1931, Bermuda’s railway had the dubious distinction of being not only the most expensive railroad per mile ever built but also, at 2.5 miles per year, the slowest. “Old Rattle and Shake,” as it was nicknamed, operated for only 17 years, done in by high maintenance costs, a shortage of available parts during World War II, and the arrival of the motorcar. When the railway was discontinued, its bridges and trestles were removed and sold. In the intervening years, the three-mile track section that ran through Bermuda’s capital city, Hamilton, was paved over. 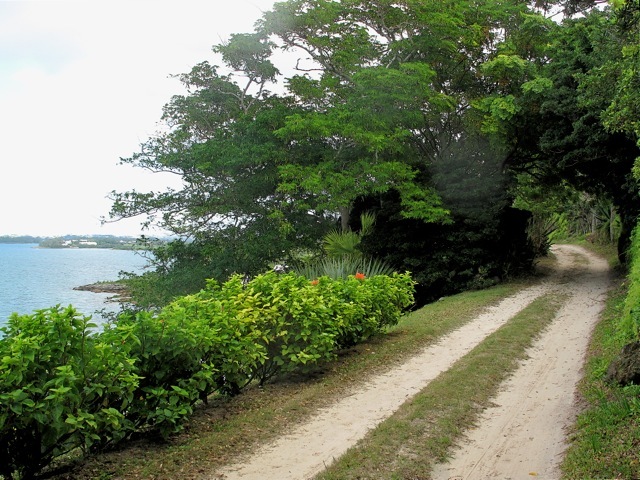 In 1984, in celebration of island’s 375th anniversary, Bermuda’s government dedicated the remaining railway lands as a path and bridleway. Walking the trail is an immersion into everyday Bermuda, an introduction to the island’s flora and fauna, and a progressive history lesson. While the adventurous part of me wanted to hoof every mile, I also wanted time to explore the charms, so I cherry picked, exploring it in sections and using Bermuda’s efficient bus and ferry system to hopscotch between access points. I began in the island’s center, where Rogers toured me through Paget Marsh, than accompanied me to Riddells Bay Station. We walked through woods and a quarry, by farmed fields and private homes. Another day, I ferried to St. George. The ocean-hugging trail section just west of town is spectacular. I moseyed by a private rail station with spur to Vincent Aster’s estate, a nature reserve, a cemetery where soldiers who died of Yellow Fever were laid to rest, pristine pocket beaches, and a limekiln. I didn’t meet another soul until the section ended at Ferry Point Park, home to three forts, including a restored Martello Tower. Using the bus, I picked up the trail again where it edges Bailey’s Bay. This is one of the most undeveloped, raw, and wild sections, barely more than a footpath in places. 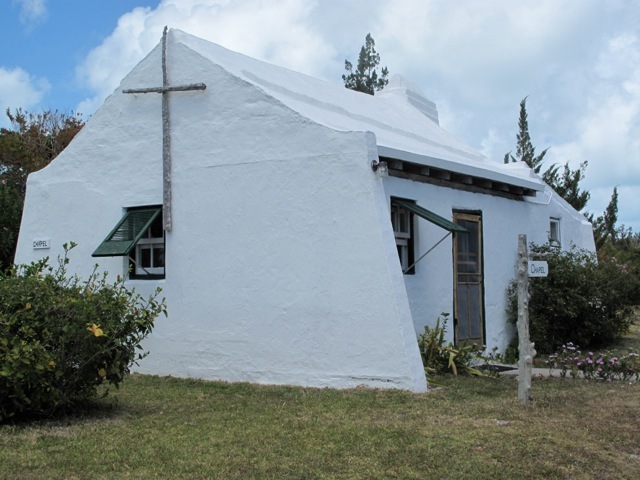 Complement it is another of the trail’s charms, the Bermuda Aquarium, Natural History Museum & Zoo. Here I hobnobbed with free-range peacocks, admired pink flamingoes, scarlet ibis, Galapagos turtles, and crocodiles. The trail’s longest near-contiguous section begins at the Somerset bus depot on the island’s west end and parallels the shorelines of Great and Little Sounds before veering to the island’s middle. 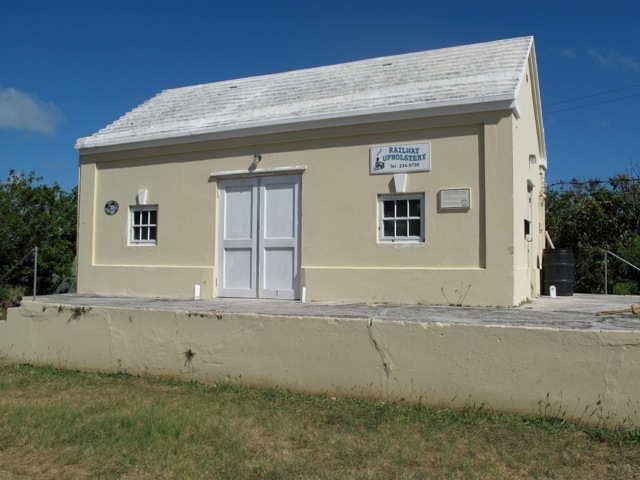 Knowing I’d be passing a fort en route, I began at the Bermuda Maritime Museum in the Royal Navy Dockyard, before spending the rest of the day playing find-and-seek with this section’s elusive charms. It took a few trial-and-error detours up pathways and lanes to find both Heydon Chapel, a lovely whitewashed church dating back to 1616, and Fort Scaur, the ruins of one of the island’s largest forts (worth the effort for the views alone). Not so elusive was Somerset Bridge, with a two-inch span just wide enough to accommodate a sailboat mast. A small sign directed me up a rough path to the Gibbs Hill Lighthouse. 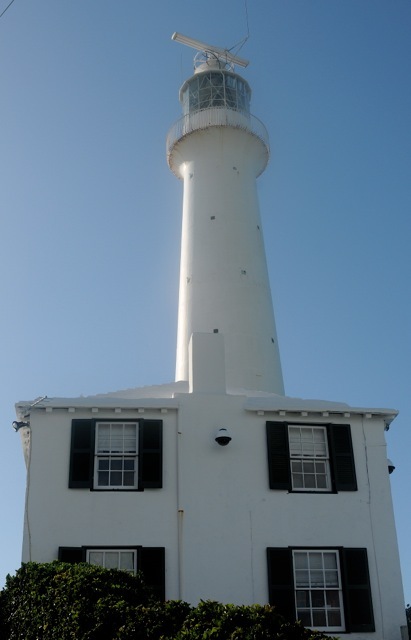 The reward for climbing the tower was a 360-degree view taking in the distinctive curve of the island as it bends from the West End to the East End, the beaches scalloping the southern coastline, island- and boat-studded Great Sound, and Hamilton’s busy harbor. Complementing the island’s famed blue waters, golf greens, pink sands and pastel buildings was a rainbow, emerging from a passing storm on the East End. It appeared to end, appropriately enough, in St. George, a golden charm on the Railway Trail bracelet. 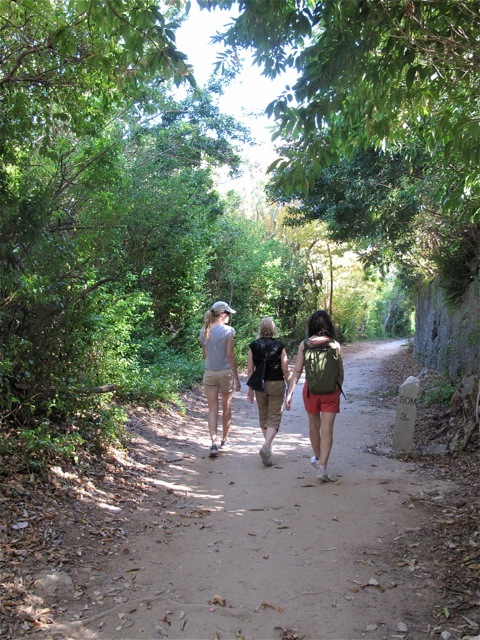 If you go: The Bermuda Railway Trail is mapped in seven sections, varying from 1.75 to 3.5 miles. Most are easily accessible by bus or ferry, making it possible to sleep in one place and walk the trail in sections, linking shorter ones together for a full-day trip. Tags: Bermuda, Railway Trail. Bookmark the permalink.